I never really thought that I would enjoy books that have a post-apocalyptic/dystopian theme, and yet this year I have read and enjoyed two already. 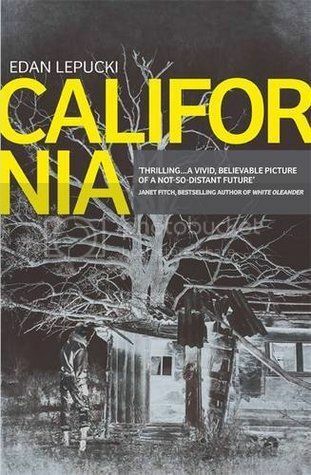 Station Eleven remains the best book I’ve read this year, but I also really liked California by Edan Lepucki. It tells the story of Cal and Frida, a couple who have left their home in Los Angeles to live in the wilderness. Los Angeles, along with most of the cities in the United States, have ceased to exist as we know them today; crumbling societies, dangerous streets, with rich people separating themselves into ‘The Communities’, where they have exclusive access to medical care, education, and the luxuries that we take for granted now in 2015. When Frida realises she is pregnant, the couple decide to seek out the company of others by making their way to a settlement nearby. Although most of the time I found it incredibly difficult to like both Cal and Frida (as well as some of the other characters), I still found the story incredibly engaging. The ‘end of the world’ can be portrayed in so many different ways, and this is the one that I find the most terrifying – a breakdown of society rather than a natural disaster. The very idea of packing up and leaving everything that is familiar and safe, and starting a life alone is scary, and Lepucki portrays that feeling well, as well as giving Frida and Cal a sense of weariness that this is their life now. Frida’s pregnancy changes everything for the couple, and forces them to seek out human interaction for the safety of their unborn child. This throws up a surprise for them, and for the reader, and the change in setting allows for a different type of story to emerge. As I mentioned, I can’t say that I honestly liked Cal and Frida for the majority of the book; it often irritated me how Frida delighted in keeping secrets from her husband, and Cal’s attitude towards Frida would have frustrated me if I had been her! But I don’t feel as though you necessarily need to like the characters in order to enjoy a book, and that’s the case here. You’re the third or fourth person to mention Station Eleven recently, I need to reserve it at the library as everyone seems to love it. Yeah, I’d definitely recommend it. Looking forward to seeing what you think!